Jan 18, 2019 ~ If you are looking for a new place to see birds, you might revisit some of the old places instead. Hermann Park is especially nice this time of year as there are many avian winter visitors and fewer humans. We stopped by the big lake one afternoon last week with our little cameras. We both had our Nikon D850s with the Nikkor 300 f/4 PF lenses plus Nikon 1.4x TCs that were on and then off and then on again. It was an overcast day, not too cold and very little wind. LOTS of little flitty birds in the bare trees. We saw plenty of Butter Butts, fast warblers and even a juvenile Flicker. And noisy Blue Jays all over. A lot of birds better suited to long lenses but we didn’t want to carry that much gear. There were a few Great Egrets and a Snowy, and some cormorants roosting in trees. And even a Red-shouldered Hawk at the top of a bare tree that never moved at all. But easiest to photograph were the ducks. So the challenge was to get interesting images of ordinary and plentiful birds. There were a LOT of Ring-necked Ducks. They are winter visitors and will be gone before long. I called them Lesser Scaups all day (another striking black-and-white duck) but Google informed me I was wrong. You actually CAN see the neck ring in the above image; it is a dark brown color between the purplish head and black chest. Presumably it was very prominent to those Victorian biologist thinking up names for dead ducks. Can you just imagine being alive and contributing to the classification process and getting to name birds? I was chasing a Red-bellied Woodpecker when I heard a huge ruckus behind me. A group of Black-bellied Whistling Ducks were trilling and whistling and splashing. This female evidently was not interested in the male’s attention! After she left the remaining males had a little brawl. It was challenging and fun to try to track the action. I am pretty sure I have the 3-D focus mode on, but it was still hard to even know where to point. Bill Maroldo did much better than I did. Whistling Ducks are so common, you can find them about anywhere now. The lady at the end of my street feeds them on her sidewalks. But when have you seen one running on water? We found a cute little Snowy fishing in the shallows but partially obscured by brush. Bill walked on and startled some Muscovy Ducks hiding behind the foliage. They flushed up and evidently this one did not see me kneeling down on the shore as he almost landed on top of me. He got so close the last couple of clicks were TOO close to focus. We were both surprised. I am not sure I even knew they COULD fly; they are pretty dumpy birds. Elegant isn’t a word that comes to mind, but he is flying. The ones I usually see at the parks just waddle around. 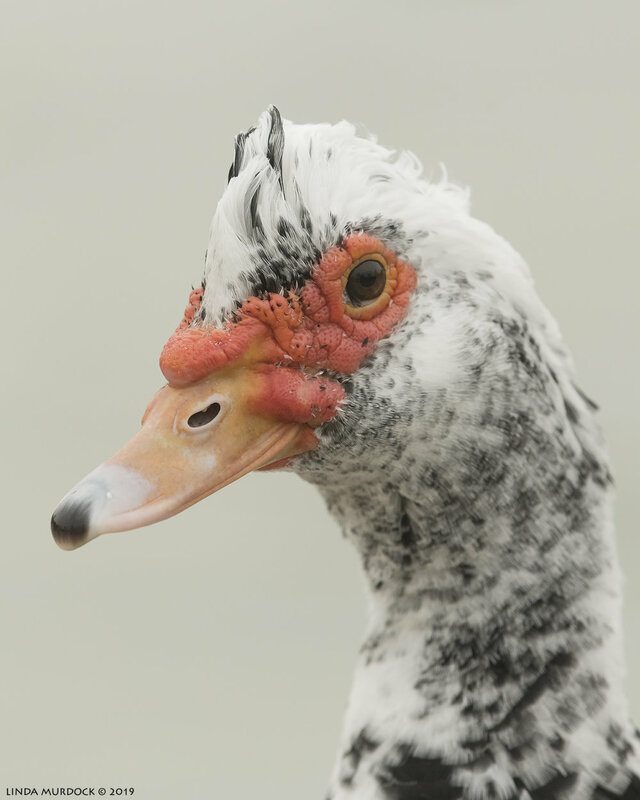 They are the only common ducks not descended from Mallards. Portrait. Interesting black skin and red growths. 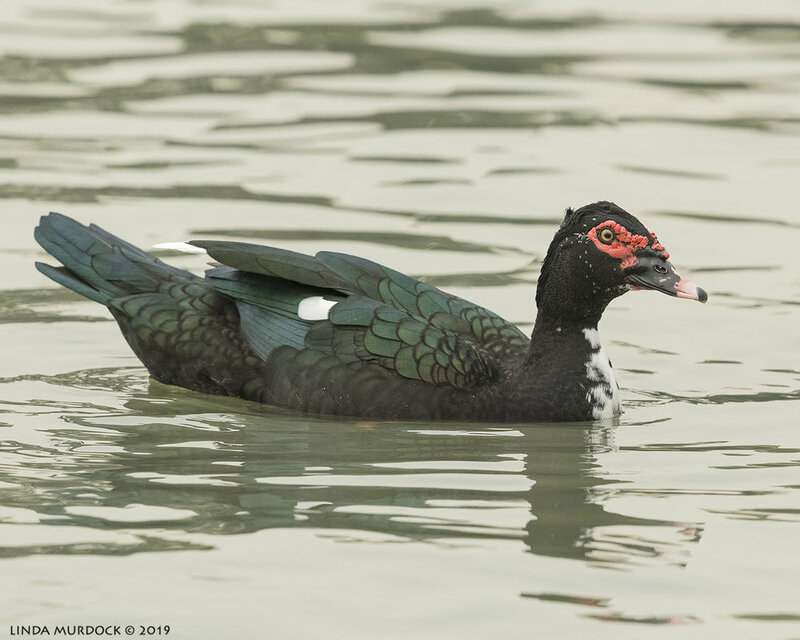 "Muscovy" is an old name for the region of Russia surrounding Moscow, but these ducks are neither native there nor were they introduced there before they became known in Western Europe. It is not quite clear how the term came about; it very likely originated between 1550 and 1600, but did not become widespread until somewhat later. The warty looking skin is very much like Rooster’s combs, but it just looks worse when it is spread out, I guess. Not warts caused by a virus but they are called caruncles and keep growing as they mature. It is the same kind of skin growth as Turkey wattles and even the skin on Turkey Vultures and Black Vultures’s heads. Evidently it is easier to keep clean than feathers and might serve for temperature regulation as well. Plus, they are secondary sexual characteristics as females can tell right away if a male is mature enough to be a good choice. Nice crest to go with his caruncles…. This one has some feathers growing out of the caruncles. 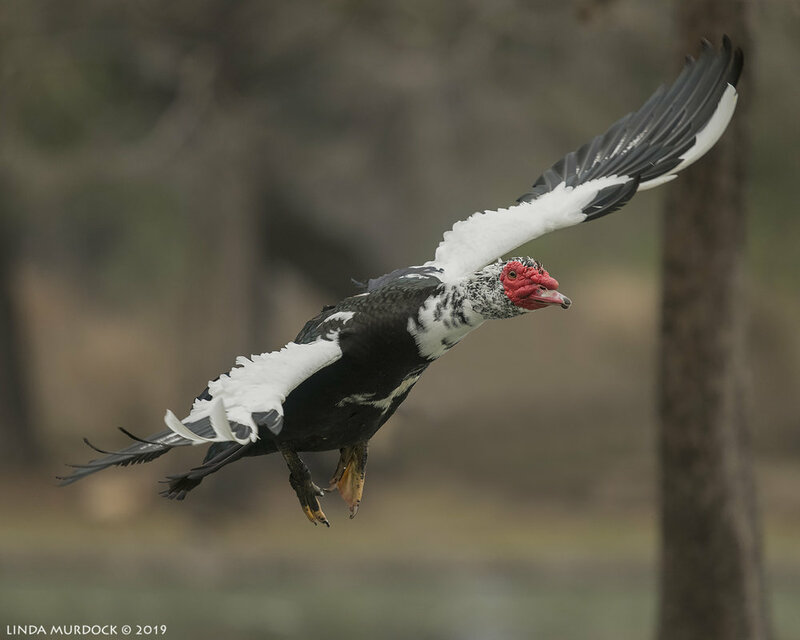 Here is a cute article about a pet Muscovy Duck and its caruncle stages. And this one’s crest is quite visible. He raised it at me and did a bit of a “huff, huff” sound. They don’t quack like ducks. I think the females might hiss a bit. Now, this guy didn’t get close enough for a portrait, but the red pattern around his head was striking. They really are nicely feathered birds; look at that iridescence and pattern! We took too many photos of flying pigeons. They are just starting to mate and in a few weeks the males will be strutting and jumping any female too slow to get away. Same with all the ducks and geese. It gets pretty wild out there and we have seen puzzled parents trying to explain to toddlers why some of the birds are … attacking the others. On the way to the truck we found a Cheeto Squirrel way out on a limb. These are Fox Squirrels but they do look like they have been into some orange snacks. The other squirrels we have around here are the smaller Eastern Gray Squirrels. At least that is what I have running through the tops of my trees and attacking my bird feeders. Spring is sneaking up on us. Oh, I know it will get cold tonight but it is only a dip below freezing. We had snow and ice and a proper winter last year; this one so far is shaping up to be a mild one. I already had my yard mowed once and soon will be out there with the weed and feed. Are you ready for Spring? In a hurry to put the coats and jackets away? Let me know in the comments below.